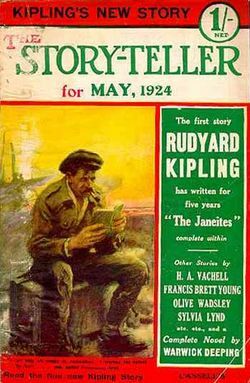 Per le note, mi sono servito anche delle Note al testo contenute nel sito della Kipling Society. Il racconto è stato pubblicato in italiano, con il titolo I seguaci di Jane, in: Rudyard Kipling, Racconti di sogno e follia, a cura di Ornella De Zordo, traduzioni di Laura Signorini e Elena Tomei, Mursia, Milano, 1992 (nella sezione "Debiti e crediti", traduzione di Laura Signorini, pagg. 80-100). 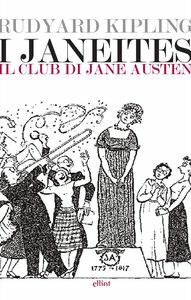 Nel 2017 Elliot ha pubblicato la mia traduzione, con il titolo I Janeites - Il club di Jane Austen. Jane lies in Winchester—blessed be her shade! This particular afternoon—in the autumn of ’20—Brother Burges, P.M., was on duty and, finding a strong shift present, took advantage of it to strip and dust all hangings and curtains, to go over every inch of the Pavement—which was stone, not floorcloth—by hand; and to polish the Columns, Jewels, Working outfit and organ. I was given to clean some Officers’ Jewels—beautiful bits of old Georgian silver-work humanised by generations of elbow-grease—and retired to the organ-loft; for the floor was like the quarterdeck of a battleship on the eve of a ball. Half-a-dozen brethren had already made the Pavement as glassy as the aisle of Greenwich Chapel; the brazen chapiters winked like pure gold at the flashing Marks on the Chairs; and a morose one-legged brother was attending to the Emblems of Mortality with, I think, rouge. ‘I don’t remember—’ I began. Brother Anthony, small, dark, and humpbacked, was hissing groom-fashion while he treated the rich acacia-wood panels of the Lodge organ with some sacred, secret composition of his own. Under his guidance Humberstall, an enormous, flat-faced man, carrying the shoulders, ribs, and loins of the old Mark ’14 Royal Garrison Artillery, and the eyes of a bewildered retriever, rubbed the stuff in. I sat down to my task on the organ-bench, whose purple velvet cushion was being vacuum-cleaned on the floor below. ‘Oh no! Ev’ry bolt an’ screw an’ nut on the chassis strained; but nothing carried away, you understand me, an’ not a scratch on the body. You’d never ’ave guessed a thing wrong till you took ’er in hand. It was a wop too: ’ead-on—like this!’ And he slapped his tactful little forehead to show what a knock it had been. ‘“Beggin’ your pardon, ’Umberstall,” says ’e, “but I ’appen to command the Circus! Now, you’re a sharp-witted man,” he says; “an’ what we’ve suffered from fool-waiters in Mess ’as been somethin’ cruel. You’ll take on, from now—under instruction to Macklin ’ere.” So this man, Macklin, that I was tellin’ you about, showed me my duties . . . . ’Ammick! I’ve got it! ’Ammick was our Major, an’ Mosse was Captain!’ Humberstall celebrated his recapture of the name by labouring at the organ-panel on his knee. ‘“I will,” says Macklin, surgin’ on ’is two thumbs. An’, mark you, none of ’em spoke! I forget whom he said was the sire of this ’Enery James-man; but ’e delivered ’em a lecture on this Jane-woman for more than a quarter of an hour. I know the exact time, because my old Skoda was on duty at ten-minute intervals reachin’ after some Jerry formin’-up area; and her blast always put out the dug-out candles. I relit ’em once, an’ again at the end. In conclusion, this Macklin fell flat forward on ’is face, which was how ’e generally wound up ’is notion of a perfect day. Bosko absoluto! ‘Wasn’t ’e, then?’ said Anthony, a little puzzled. ‘’E’d never gone beyond the Blue Degrees, ’e told me. Any’ow, ’e’d lectured ’is superior officers up an’ down; ’e’d as good as called ’em fools most o’ the time, in ’is toff’s voice. I ’eard ’im an’ I saw ’im. An’ all he got was—me told off to put ’im to bed! And all on account o’ Jane! Would you have let a thing like that get past you? Nor me, either! Next mornin’, when his stummick was settled, I was at him full-cry to find out ’ow it was worked. Toff or no toff, ’e knew his end of a bargain. First, ’e wasn’t takin’ any. He said I wasn’t fit to be initiated into the Society of the Janeites. That only meant five bob more—fifteen up to date. ‘No denyin’ it. I ’ad. So, for one pound, he communicated me the Password of the First Degree, which was Tilniz an’ trap-doors. ‘We settled all this while we was skinnin’ spuds for dinner at the back o’ the rear-truck under our camouflage-screens. Gawd, ’ow that glue-paint did stink! Otherwise, ’twasn’t so bad, with the sun comin’ through our pantomime-leaves, an’ the wind marcelling the grasses in the cutting. Well, one thing leading to another, nothin’ further ’appened in this direction till the afternoon. We ’ad a high standard o’ livin’ in Mess—an’ in the Group, for that matter. I was talon’ away Mosses lunch—dinner ’e would never call it—an’ Mosse was fillin’ ’is cigarette-case previous to the afternoon’s duty. Macklin, in the passage, comin’ in as if ’e didn’t know Mosse was there, slings ’is question at me, an’ I give the countersign in a low but quite distinck voice, makin’ as if I ’adn’t seen Mosse. Mosse looked at me through and through, with his cigarette-case in his ’and. Then ’e jerks out ’arf a dozen—best Turkish—on the table an’ exits. I pinched ’em an’ divvied with Macklin. ‘’Pretty free with your Bradburys, wasn’t you?’ Anthony grunted disapprovingly. ‘Yes. I was after my money’s worth; an’ Macklin, havin’ put ’is ’and to the plough, wasn’t one to withdraw it. Otherwise, if I’d pushed ’im, I’d ha’ slew ’im. Our Battery Sergeant Major nearly did. For Macklin had a wonderful way o’ passing remarks on a man’s civil life; an’ he put it about that our B.S.M. had run a dope an’ dolly-shop with a Chinese woman, the wrong end o’ Southwark Bridge. Nothin’ you could lay ’old of, o’ course; but——’ Humberstall let us draw our own conclusions. ‘Just like ’avin’ the Password, eh?’ was Humberstall’s comment. ‘’You quick at gettin’ things off by ’eart?’ Anthony demanded. ‘“For writin’ obese words on the breech o’ the ten-inch,” says the B.S.M. She was our old Skoda that I’ve been tellin’ you about. We called ’er “Bloody Eliza.” She ’ad a badly wore obturator an’ blew through a fair treat. I knew by Macklin’s face the B.S.M. ’ad dropped it somewhere, but all he vow’saifed was, “Very good, Major. We will consider it in Common Room,” The B.S.M, couldn’t ever stand Macklin’s toff’s way o’ puttin’ things; so he goes off rumblin’ like ’ell’s bells in an ’urricane, as the Marines say. Macklin put it to me at once, what had I been doin’? Some’ow he could read me like a book. ‘Gawd! What a Circus you must ’ave been,’ was Anthony’s gasping comment. ‘That’s right; but I almost wish I ’adn’t,’ he sighed. ‘I was ’appier there than ever before or since. Jerry’s March push in ’Eighteen did us in; an’ yet, ’ow could we ’ave expected it? ’Ow could we ’ave expected it? We’d been sent back for rest an’ runnin’-repairs, back pretty near our base; an’ our old loco’ that used to shift us about o’ nights, she’d gone down the line for repairs. But for ’Ammick we wouldn’t even ’ave ’ad our camouflage-screens up. He told our Brigadier that, whatever ’e might be in the Gunnery line, as a leadin’ Divorce lawyer he never threw away a point in argument. So ’e ’ad us all screened in over in a cuttin’ on a little spur-line near a wood; an’ ’e saw to the screens ’imself. The leaves weren’t more than comin’ out then, an’ the sun used to make our glue-paint stink. Just like actin’ in a theatre, it was! But ’appy. But ’appy! I expect if we’d been caterpillars, like the new big six-inch hows, they’d ha’ remembered us. But we was the old La Bassée ’15 Mark o’ Heavies that ran on rails—not much more good than scrap-iron that late in the war. An’, believe me, gents—or Brethren, as I should say—we copped it cruel. Look ’ere! It was in the afternoon, an’ I was watchin’ Gander instructin’ a class in new sights at Lady Catherine. All of a sudden I ’eard our screens rip overhead, an’ a runner on a motor-bike come sailin’, sailin’ through the air—like that bloke that used to bicycle off Brighton Pier—and landed one awful wop almost atop o’ the class. “’Old ’ard,” says Gander. “That’s no way to report. What’s the fuss?” “Your screens ’ave broke my back, for one thing,” says the bloke on the ground; “an’ for another, the ’ole front’s gone.” “Nonsense,” says Gander. ’E ’adn’t more than passed the remark when the man was vi’lently sick an’ conked out. ’E ’ad plenty papers on ’im from Brigadiers and C.O.’s reporting ’emselves cut off an’ askin’ for orders. ’E was right both ways—his back an’ our front. The ’ole Somme front washed out as clean as kiss-me-’and!’ His huge hand smashed down open on his knee. ‘We ’eard about it at the time in the ’Oly Land. Was it reelly as quick as all that?’ said Anthony. ‘Quicker! Look ’ere! The motor—bike dropped in on us about four pip-emma. After that, we tried to get orders o’ some kind or other, but nothin’ came through excep’ that all available transport was in use and not likely to be released. That didn’t ’elp us any. About nine o’clock comes along a young Brass ’At in brown gloves. We was quite a surprise to ’im. ’E said they were evacuating the area and we’d better shift. “Where to?” says ’Ammick, rather short. ‘“Mutinous ’ounds,” says ’Amrnick. “But we live in a democratic age. D’you suppose they’d object to kindly diggin’ ’emselves in a bit?” “Not at all,” says Gander. “The B.S.M.’s kept ’em at it like terriers for the last three hours.” “That bein’ so,” says ’Ammick, “Macklin’ll now fetch us small glasses o’ port.” Then Mosse comes in—he could smell port a mile off—an’ he submits we’d only add to the congestion in Amiens if we took our crowd there, whereas, if we lay doggo where we was, Jerry might miss us, though he didn’t seem to be missin’ much that evenin’. ‘’Adn’t you ’ad enough by then?’ asked Anthony. Worshipful Brother Burges, from the floor of the Lodge, called us all from Labour to Refreshment. Humberstall hove himself up—so very a cart-horse of a man one almost expected to hear the harness creak on his back—and descended the steps. ‘One or other of ’em always comes for ’im. He’s apt to miss ’is gears sometimes,’ Anthony explained to me, as we followed. Jane riposa a Winchester - sia benedetta la sua ombra! Gloria, amore e onore a Jane d'Inghilterra! Nella Loggia d'Istruzione annessa a quella "Fede e Lavoro N. 5837 E.C. ", che è già stata descritta, (1) il sabato pomeriggio era dedicato alle pulizie settimanali, per le quali l'aiuto di tutti i confratelli in visita era il benvenuto, sotto la direzione del responsabile di giornata; la ricompensa era un piccolo rinfresco e l'incontro con gli altri membri. Quel pomeriggio in particolare, nell'autunno del '20, era di servizio il fratello Burges. P.M., (2) che, trovandosi a disposizione una squadra numerosa, colse l'occasione per smuovere e spolverare tutti gli arazzi e le tende, ripassare a mano ogni centimetro della pavimentazione, di pietra e non di moquette, e lucidare le colonne, i gioielli, i grembiuli e l'organo. Io ero incaricato di pulire i gioielli di alcuni responsabili, dei begli esemplari di antica argenteria georgiana umanizzati da generazioni di oli di gomito, e mi ero messo nella galleria dell'organo, visto che il pavimento somigliava al cassero di poppa di una nave da guerra la sera di un ballo. Una mezza dozzina di confratelli aveva già reso la pavimentazione lucida come la navata della Greenwich Chapel, i capitelli di ottone scintillavano come oro puro nel bagliore dei contrassegni dei seggi, e un confratello imbronciato con una gamba sola era intento agli Emblemi di Mortalità (3) con, credo, dell'ossido di ferro. Mentre passavamo, si rivolse a fratello Burges, "Devono essere una via di mezzo tra il colore delle albicocche mature e quello della schiuma di mare semiaffumicata. Nella mia Loggia-Madre li mantenevamo così, una delizia a guardarli." "Non ho mai visto nessuno pulirli in modo così accurato", dissi. "Aspetta di vedere l'organo", disse fratello Burges. "Una volta finito ti ci potrai fare la barba. Lassù è all'opera fratello Anthony, il proprietario di taxi che hai conosciuto qui il mese scorso. Non credo che tu conosca fratello Humberstall, vero?" "Non l'avresti dimenticato se l'avessi conosciuto. Ora fa il parrucchiere, da qualche parte dietro Ebury Street. Era nell'Artiglieria da fortezza. È saltato in aria due volte." "Ne parla molto?" chiesi, mentre eravamo all'inizio delle scale della galleria dell'organo. "Nooo. Non molto di più di quanto faceva Lazzaro, presumo." (4) Fratello Burges si allontanò per mettere qualcun altro al lavoro. Fratello Anthony, piccolo, scuro e con la gobba, stava fischiando come uno stalliere, mentre trattava gli elaborati pannelli di legno d'acacia dell'organo con una qualche mistura di sua invenzione, sacra e segreta. Sotto la sua guida, Humberstall, enorme e con la faccia piatta, con spalle, costole e lombi da vecchio modello '14 dell'Artiglieria Reale da fortezza, e gli occhi da cane da riporto un po' confuso, strofinava l'intruglio. Mi accinsi al mio compito sedendomi sulla panca dell'organo, sui cui cuscini di velluto color porpora si stava passando l'aspirapolvere al piano di sotto. "Ora sì", disse Anthony dopo cinque minuti di energico lavoro da parte di Humberstall. "Ora sì che sta venendo fuori qualcosa di guardabile! Prenditela con calma, e continua con quello che mi stavi raccontando su quel Macklin." "Io... io non ce l'avevo per niente con lui", disse Humberstall, "a parte il fatto che di nascita era un damerino; ma non si vedeva fino a quando non era del tutto sbronzo. Se era solo ubriaco pareva uno normale. Ma quando era sbronzo, veniva fuori tutto. Comunque, tutto sommato i miei doveri di cameriere della mensa me li aveva spiegati bene." "Sì, sì. Ma che diavolo ti ha fatto tornare alla tua compagnia? Non hai detto che la commissione medica ti aveva dichiarato ormai fuori gioco, dopo che a Eatables (5) era scoppiato il deposito?" "Commissione o non commissione, io non ce la facevo a restare a casa... non con mia madre che correva come un coniglio in quelle tre stanze ogni volta che i Gotha cercavano di beccare la Victoria, (6) e mia sorella scriveva alle mie zie quattro pagine per raccontarglielo. Non faceva per me, grazie! fino a quando la guerra non fosse finita. Così me la filai con un reparto - non stavano tanto a guardare nel '17, purché tornassero i conti - e mi sono riunito alla mia compagnia da qualche parte dietro a Lar Pug Noy," (7) almeno mi pare che fosse lì." Humberstall si fermò per qualche istante e corrugò la fronte. "Poi... mi ammalai, di una cosa o l'altra, così mi dissero; ma so che quando ripresi servizio, il sergente maggiore della nostra batteria dice che non si aspettavano che tornassi, e... e, una cosa tira l'altra - per non farla troppo lunga - ho dato un po' da matto davanti al maggiore... al maggiore... prima o poi mi scordo pure il mio nome... il maggiore..."
"Non importa", lo interruppe Anthony. "Continua! Ti verrà in mente mentre parli!" "Un attimo. Ce l'ho sulla punta della lingua." Humberstall lasciò cadere lo straccio e aggrottò di nuovo la fronte, immerso nei pensieri. Anthony si rivolse a me e si lanciò subito in una brillante descrizione dello scontro del suo taxi con uno spartitraffico a Marble Arch, in una giornata in cui si scivolava e dopo tre metri di slittata. "Oh, no! Si sono allentati tutti i bulloni, le viti e i dadi del telaio, ma non si è staccato niente, capisci, e nemmeno un graffio sulla carrozzeria. Non l'avresti mai indovinato finché non la mettevi in moto. C'era stata anche una botta (8) frontale... come questa!" E si diede una pacca sulla piccola fronte avveduta per mostrare che razza di colpo era stato. "Il tuo maggiore poi ti ha servito a dovere?" proseguì voltandosi indietro verso Humberstall, che emerse lentamente dalla sua astrazione. «Scusami tu, 'Umberstall» dice, «ma si dà il caso che sia io a comandare la compagnia! Vedi, tu sei una persona molto acuta», dice, «e quello cha abbiamo sofferto a mensa con dei camerieri stupidi è stato qualcosa di terribile. D'ora in poi ci penserai tu, e sarai istruito da Macklin.» Così questo tizio che ti dicevo, Macklin, mi fece vedere che dovevo fare.... 'Ammick! Ci sono! 'Ammick era il nostro maggiore, e Mosse il capitano!" Humberstall celebrò il recupero del nome mettendosi a lavorare in ginocchio al pannello dell'organo. "Sta' attento! Così lo spaccherai", protestò Anthony. "Scusa! Mia madre mi diceva spesso che non mi rendo conto della mia forza. Adesso sta' a sentire una cosa curiosa. Questo maggiore - mi sta tornando tutto in mente - era un avvocato divorzista molto quotato, e Mosse, il nostro capitano, era il numero uno dell'Agenzia Investigativa Private Mosse. Ne hai sentito parlare? Mogli controllate mentre tu stai lì a roderti, e così via. Be', quei due, da civili, si erano, per così dire, incrociati continuamente per anni, ma non si erano mai visti fino alla guerra. Di conseguenza, a mensa chiacchieravano più che altro di casi famosi nei quali si erano trovati coinvolti. 'Ammick raccontava la parte finale della faccenda in tribunale, e tutto quello che era stato lasciato fuori dalla difesa, e Mosse dei fatti concreti che riguardavano chi era in colpa, negli alberghi e così via. In quella mensa ho sentito i discorsi più interessanti che mi sia mai capitato di sentire sia prima che dopo. È perché gli artiglieri sono un corpo scientifico." "Accidenti a loro!" disse Anthony. "Quando gli succede qualcosa mettono tutto in un libro. Non c'è libro che tenga quando il camion ti muore in Terrasanta. Lì ci vuole cervello." "Be', poi", proseguì Humberstall, "scappa fuori questa faccenda della società segreta di cui ti avevo cominciato a parlare. Una volta che quei due - 'Ammick e Mosse - ebbero finito con le relazioni matrimoniali - e bada, non erano come i ravanelli, non si ripetevano quasi mai (9) - cominciarono a parlare, il più delle volte, di questa donna della società segreta di cui ti parlavo, questa Jane. Era l'unica donna della quale li ho sentiti dire una buona parola. Secondo loro, Jane era senza confronti. Allora, non sapevo che lei fosse una società. Il fatto è che all'inizio li sentivo solo a sprazzi, dato che dovevo essere istruito da quel Macklin sul lavoro di mensa. Quello che attirò la mia attenzione fu che a loro si unì un nuovo tenente. Lo chiamavamo «Gander», (10) dato che aveva il profilo spiccicato a quell'uccello. Di mestiere faceva il matematico attuariale - quelli che calcolano quanto ha da vivere un civile. Né 'Ammick né Morse sprecavano il fiato con lui a mensa. Continuavano a chiacchierare come al solito, e come al solito, al momento giusto, tornavano a Jane. Gander tende una delle sue enormi orecchie piene di geloni e fa scrocchiare le giunture delle dita gelate. «Per Dio! Jane?» dice. «Sì, Jane» dice 'Ammick, secco e gerarchico. «Grazie al cielo!» dice Gander. «Da dove vengo io, laggiù in prima linea, si parlava di 'Bubbly'». (Una qualche dannata rivista o altro, presumo). (11) Be', né 'Ammick né Mosse erano dei chiacchieroni, o molto espansivi in quella faccenda, ma non appena Gander ebbe fatto quell'osservazione tutti e due strinsero la mano al giovincello attraverso il tavolo e fecero portare di nuovo il porto. Era una parola d'ordine, certo! Poi cominciarono con Jane, tutti e tre, senza far caso al grado. La cosa mi spinse a starli a sentire. Sentii subito 'Ammick dire..."
"Aspetta un po'", lo interruppe Anthony. Ma tu che stavi facendo a mensa?" "«Avuto da chi, signore? Provatelo», dice Gander, prima che i suoi superiori potessero dire una parola. "«Lo farò», dice Macklin, sollevandosi sui due pollici. E, nota bene, nessuno di loro fiatò! Mi sono scordato chi disse che era il padre di questo 'Enery James, ma fece una conferenza di più di un quarto d'ora su questa donna, questa Jane. Lo so con esattezza, perché il mio vecchio Skoda era al lavoro ogni dieci minuti per beccare qualche zona in cui si stava sistemando Jerry, (13) e il botto spegneva sempre le candele del rifugio. Le avevo già riaccese una volta, e lo stesso alla fine. A conclusione, questo Macklin cadde a faccia avanti, il modo in cui lui generalmente considerava perfetto per chiudere una giornata. Ubriaco fradicio! "Per farla breve, è stato questo che all'inizio mi ha messo quell'idea in testa. A te non sarebbe successo? Anche se Macklin fosse stato un massone importante..."
"Non lo era, in quel periodo?" disse Anthony, un po' perplesso. "Mi aveva detto che non era mai andato oltre i gradi azzurri. A ogni modo, aveva fatto pelo e contropelo ai suoi superiori, ed era come se gli avesse dato degli stupidi per la maggior parte del tempo, con quella voce da damerino. L'ho sentito e l'ho visto. E tutto quello che gli capitò fu... che mi dissero di portarlo a letto! E tutto per via di Jane! Tu avresti lasciato perdere così? Neanch'io! La mattina dopo, quando il suo stomaco era a posto, mi gli sono messo alle costole per scoprire come funzionava. Damerino o non damerino, sapeva il fatto suo. All'inizio non voleva parlarne. Diceva che non ero adatto a essere ammesso nella società dei Janeites. Il che significava solo cinque scellini in più, quindici di adesso. "«So che cos'è un trabocchetto», gli dico, «ma che diavolo significa Tilniz? "Stabilimmo tutto questo mentre pelavamo le patate per il pranzo dietro a un rimorchio che stava sotto le protezioni mimetiche. Oddio, come puzzava quella vernice! Per il resto, non era male, con il sole che filtrava attraverso le foglie finte, e il vento che faceva i boccoli all'erba nella trincea. Be', fra una cosa e l'altra, su questo non successe nulla fino al pomeriggio. A mensa il tenore di vita era alto, e anche nel gruppo, se è per questo. Stavo sistemando dopo lo spuntino di Mosse - non l'avrebbe mai chiamato pranzo - e Mosse stava riempiendo il portasigarette prima del servizio pomeridiano. Macklin, dal corridoio, entrò come se non sapesse che Mosse era lì, butta lì la domanda e io gli do la parola d'ordine a voce bassa ma molto chiara, come se non avessi visto Mosse. Mosse mi squadrò da capo a piedi, col portasigarette in mano. Poi ne tirò fuori una mezza dozzina - del migliore tabacco turco - le mise sul tavolo e uscì. Io le afferrai e le divisi con Macklin. "Un po' di manica larga coi tuoi Bradbury, no?" grugnì Anthony con aria di disapprovazione. "Che differenza faceva? In effetti Gander ci diceva che in media non potevamo aspettarci più di sei settimane di vita a testa, e, comunque, io non ho mai avuto rimpianti. Ma non capire male... la preparazione fu un po' dura. In primo luogo, sotto la guida di Macklin per le istruzioni su Jane." "Oh! ma Jane era reale allora?" Anthony mi guardò per un istante, mentre faceva la domanda. "Non l'avevo proprio capito." "Reale!" la voce di Humberstall divenne quasi un acuto. "Jane? Certo, era una piccola, vecchia zitella che aveva scritto una mezza dozzina di libri più o meno cent'anni fa. Non è che dentro ci fosse molto, in tutti. Lo so. Li ho dovuti leggere. Non erano né avventurosi, né sconci, né c'era niente che si potesse chiamare interessante... tutti su ragazze di diciassette anni (cominciavano presto, a quel tempo), incerte su chi sposare; e balli, giochi a carte, picnic e qualche giovanotto che va a cavallo a Londra a farsi tagliare barba e capelli. (17) A quel tempo ti ci voleva una giornata intera, se volevi andare da un bravo barbiere. Si mettevano pure le parrucche, se erano dottori o preti. Tutto questo mi interessava, visto che mestiere faccio, e che tagliavo i capelli agli uomini ogni due settimane. Macklin mi prendeva in giro perché ero un parrucchiere. Si permetteva pure di fare commenti." Humberstall recitò con entusiasmo un frammento di quella che doveva essere stata una superba litania ammonitrice, che finiva con, "Tu parrucchiere con la mente vuota, la testa pieni di pidocchi, i calzoni lunghi e pieno di profumo." "E tu ci stavi?" Gli occhi acuti di Anthony lo scrutavano. "Sì. Stavo dietro ai miei soldi, e Macklin, una volta messo mano a qualcosa, non era uno che si tirava indietro. Altrimenti l'avrei schiacciato, l'avrei ammazzato. Il sergente maggiore della batteria quasi lo fece. Perché Macklin aveva un modo straordinario di fare commenti sulla vita civile, e aveva sparso la voce che il nostro sergente maggiore aveva tenuto una casa da oppio e un bordello insieme a una cinese, dalla parte sbagliate del Southwark Bridge. Niente che si potesse dimostrare, naturalmente, ma..." Humberstall lasciò che traessimo noi le conclusioni. "Mi fa venire in mente", disse Anthony schioccando le labbra, "che il mese scorso mi è successo un po' un casino per via di una corsa a Fulham Road. Mi ha chiamato Forder (18) pi-do-cchioso. L'ho informato che ero proprietario del taxi, e che poteva vedere da solo che la macchina era perfettamente pulita. Non gli è bastato. Diceva che era infestata." "Come è andata a finire?" chiesi. "Uno di quei grassoni bolscevichi in divisa blu della polizia postbellica (che come al solito se ne fregava di dirigere il traffico) ci chiese di tubare con più calma. Il burlone buttò lì qualcosa in arabo, e questo provocò la firma dell'armistizio. Era stato attendente, un dannato attendente del Gloucestershire, che avevo aiutato a fare la raccolta delle arance a Jaffa, in Terrasanta!" "È difficile da dire. So che viveva a Hendon o a Cricklewood. Ce lo portai. Dobbiamo aver parlato di sionismo o qualcosa del genere, perché alle sette del mattino del giorno dopo lui e io stavamo cercando di fare benzina in una latteria di St. Alban. Non ce l'avevano. Per molti aspetti questa guerra si potrebbe dire che è stata una seccatura pubblica, ma non si può negare che aiuta a rendere la vita più semplice. Il figlio del lattaio era stato in Giordania con i trasporti con i cammelli. Così ci ha offerto rum e latte." "Proprio come avere la parola d'ordine, eh?" fu il commento di Humberstall. "Giusto! La nostra era Imshee kelb. (19) Non così difficile da ricordare come la tua roba su Jane." "Jane non era così difficile, non come la descriveva di solito Macklin", riprese Humberstall. "Avevo solo sei libri da ricordare. Imparai i nomi a memoria così come me li diceva Macklin. Ce n'era uno che si chiamava Persuasione, il primo, e il resto in un mucchio, salvo un altro che parlava di una qualche abbazia e una cosa simile, l'ultimo, a tre lunghezze. Ma, come stavo dicendo, quello che mi colpiva era che non mi dicevano niente, non c'era niente dentro. Proprio niente, credetemi." "A ogni modo, sembra che ti abbiano colpito molto", disse Anthony. "Voglio dire che i personaggi non erano di nessuna utilità! Erano esattamente come la gente che incontri tutti i giorni. Uno faceva il curato... il reverendo Collins.... sempre intento a cercare di sposarsi per soldi. Be', quando ero boy-scout lui o il fratello gemello era il nostro capo. E c'era una duchessa, o moglie di un baronetto, dritta come un fuso e ostinata, che non faceva che imprecare con chi non voleva fare quello che diceva lei; Lady... Lady Catherine (fra un secondo ci arrivo)... De Bugg. Prima che ma' comprasse il negozio di parrucchiere a Londra, conoscevo la moglie di un droghiere all'ingrosso vicino a Leicester (io sono del Leicestershire) che era spiccicata a lei. E... oh, sì... c'era una certa Miss Bates; una vecchia zitella che scorrazzava dappertutto come una gallina con la testa penzoloni e la lingua sciolta da tutte e due le parti. Avevo una zia come lei. Buona come il pane... ma, insomma, avete capito." "Oh, Signore! Sì" disse Anthony con simpatia. "E poi hai scoperto che cosa significava Tilniz? Io vado sempre a caccia del significato delle cose strane." "Sì, era un maiale di generale in pensione, e si dava un gran da fare. Si danno tutti un gran da fare, con calma, in Jane. Lui si considerava un perfetto gentiluomo, ma invece si comportava sempre come un cane da caccia. Conosci il tipo. Cacciò da casa sua una ragazza perché non aveva un soldo... dopo, bada bene, averla incoraggiata ad accalappiare il figlio perché pensava che ce n'avesse tanti." "Ma succede tutte le volte", disse Anthony. "Ma sì, mia madre..."
"«I piedi mi formicolavano abbastanza», dissi io, «ma non per via di Jane. Da quel punto di vista, niente di straordinario», dico. "«Che il cielo mi dia la pazienza!», dice lui, sistemandosi i capelli con quelle mani così piccole. «Ogni dannata cosa su Jane è straordinaria per un vero Janeite! Fu lì», disse, «che Miss... Come si chiama (lui il nome lo sapeva, sono io che me lo sono scordato) rinnovò dopo nove anni il suo fidanzamento con il capitano Tal dei Tali.» (21) E mi mostrò una pagina e mezza da imparare a memoria... di Persuasione, credo." "Tu fai presto a imparare le cose a memoria?" chiese Anthony. "Di solito no. Allora però feci presto, ma forse Macklin era bravo ad assegnare i compiti. Disse che una volta era stato une specie di insegnante, e che mi avrebbe rimesso in moto il cervello a costo di rompersi il suo. Fu poco prima che il sergente maggiore della batteria se la prendesse con lui per quello che aveva detto sulla moglie cinese e il bordello." "Ma che aveva detto davvero Macklin?" chiedemmo insieme Anthony e io. Humberstall ce ne parlò solo in parte. Era roba difficile da spiattellare senza cambiare qualcosa, nel pio mondo del dopoguerra. "E che cosa faceva il vostro sergente maggiore da civile?" chiesi io alla fine. "«Per aver scritto parole oscene sulla culatta del dieci pollici», dice il sergente maggiore. Era il nostro vecchio Skoda di cui vi parlavo. Lo chiamavamo 'Eliza la sanguinaria'. Aveva l'otturatore mezzo consumato e saltava via che era una bellezza. Capii dalla faccia di Macklin che il sergente maggiore l'aveva raccolto da qualche parte, ma tutto quello che si degnò di dire fu, «Benissimo, maggiore. Prenderemo in esame la cosa nella sala di ritrovo.» (22) Il sergente maggiore non poteva soffrire l'aria da damerino nel dire le cose, così se ne andò brontolando come fanno le campane dell'inferno in una tempesta, come dicono i fanti di marina. Macklin si rivolse subito a me per chiedermi che cosa avevo combinato. In qualche modo riusciva a leggermi in faccia come in un libro aperto. "Be', tutto quello che io avevo fatto - e gli dissi che ne era lui il responsabile - era stato di scrivere col gesso sui cannoni. 'Ammick non si era mai preoccupato di che cosa ci scrivessero sopra i suoi uomini. Diceva che serviva a interessarli al lavoro. Puoi leggere ogni genere di commento scritto col gesso sulle placche laterali o sulle casse del materiale." "Che genere di commenti?" disse Anthony un po' maligno. "Glielo dissi. Non era giusto, e lui fece un salto allo Skoda per metterlo a posto. Quando torna, dice che Gander c'era stato prima di lui e aveva corretto l'errore. Ma quel pomeriggio, dopo il pranzo, ci presentiamo tutti e due davanti al maggiore, proprio lui; 'Ammick sul seggio, per così dire, Mosse su un altro, e il sergente maggiore che accusava Macklin di aver scritto parole oscene sulle proprietà in servizio attivo di Sua Maestà. Quando venne fuori che l'imputato ero io e non Macklin, il sergente maggiore smise di agitare le mani e mise il broncio come un bambino. Disse comunque a 'Ammick che non poteva sperare di mantenere la disciplina se non veniva dato il buon esempio, riferendosi ovviamente a Macklin." "Sì, l'ho già sentito tutto questo", disse Anthony, con un grugnito sprezzante. "La cosa peggiore è che spesso è vero." "'Ammick lo riprese aspramente sulla Legge Militare, che, disse, era persino più imparziale delle norme civili." "Dio mio!" questo uscì dal profondo del cuore sdegnato di Anthony. "Così Macklin andò e lo portò, e il sergente maggiore ebbe il suo bicchiere come gli altri. Poi dibatterono se un inserviente della mensa e non combattente fosse autorizzato a scrivere col gesso sui cannoni ('Ammick contro Mosse). Dopo un po', 'Ammick, come ufficiale al comando, ebbe la meglio, e io e Macklin fummo severamente ammoniti per aver violato i diritti dei combattenti, e il sergente maggiore fu avvertito che se l'abuso si fosse ripetuto avrebbe potuto giudicarci sommariamente. Ebbe qualche bicchiere di porto e se ne andò del tutto soddisfatto. Poi venne il mio turno, mentre Macklin stava portando il tè, e, una cosa tira l'altra, 'Ammick mi mise alla prova, in pratica su tutti i gradi di Janeite. In vita mia non mi era mai capitato niente di simile." "Sì, ma che cosa gli hai detto?" disse Anthony. "Io non sono mai stato capace di pensare alla svelta a una bugia, quando mi serve." "Non c'era bisogno di dire bugie. Gli dissi che lo Skoda, visto da dietro, mentre era sollevato, mi aveva fatto venire in mente Lady De Bugg. Su questo punto mi diedero ragione, ma dissero che mi ero sbagliato sul generale Tilney. Secondo loro, il Marina da dodici pollici avrebbe dovuto essere battezzato Miss Bates. Io dissi che mi era passata per la mente la stessa idea, finché non avevo visto la scanalatura del generale. Allora mi ero reso conto che doveva essere il generale e nessun altro. Ma mi promossero a pieni voti per il reverendo Collins... sul nove punto due." "E tu li assecondavi in questo genere di discorsi?" Le sopracciglia color volpe di Anthony si alzarono fin quasi ai capelli. "Mentre aiutavo Macklin a servire il tè... sì. Sembrava un esame, e volevo fargli onore come Janeite." "E... e loro che dissero?" "Dissero che faceva molto onore a entrambi. Io non bevo, così mi diedero un centinaio di cicche." "Dio! In che razza di compagnia sei stato", osservò Anthony sbuffando. "Era un bel gruppetto. Non l'avrei cambiato con nessun altro." Humberstall fece un profondo sospiro mentre aiutava Anthony a rimettere a posto il pannello dell'organo. Noi tutti ammirammo in silenzio, mentre Anthony si metteva in tasca la sua mistura lucidante segreta, che dimorava in una scatola di tabacco di latta. Io avevo trascurato il lavoro per stare a sentire Humberstall. Anthony si allungò con calma e prese un gioiello da segretario e uno straccio. Humberstall controllò il suo riflesso nel legno lucido. "Quasi", disse criticamente, tenendo la testa da un lato. "Non con un rasoio dell'esercito. Potresti fartela con un rasoio di sicurezza, però", disse Anthony. E, in effetti, come aveva previsto fratello Burges, ci si poteva fare la barba comodamente. "Ti sei mai imbattuto qualche volta in qualcuno di loro in seguito?" chiese Anthony subito dopo. "Ormai non ce ne sono molti a cui correre dietro. Con l'artiglieria o ci rimetti il collo o niente. Noi l'abbiamo beccata. Tra capo e collo. A tempo debito." "Be', tu ne sei uscito intero." Anthony lo disse mezzo deciso e mezzo rassicurante, ma Humberstall non se ne sentì consolato. "È vero, ma quasi vorrei che non fosse successo", sospirò. "Lì sono stato felice più di prima e dopo. L'avanzata di Jerry (24) nel marzo del diciotto ci tolse di mezzo; e come avremmo mai potuto aspettarcela? Come avremmo mai potuto aspettarcela? Eravamo stati mandati indietro per riposarci e per le solite riparazioni, indietro quasi fino alla nostra base, e la vecchia locomotiva, che di solito ci portava di notte, era impegnata sulla linea per le riparazioni. Ma secondo 'Ammick non avremmo avuto nemmeno bisogno di mimetizzarci. Disse al generale di brigata che, per quanto fosse nell'artiglieria, come eminente avvocato divorzista non tralasciava mai nulla. Così ci fece nascondere tutti in una trincea su un piccolo sperone vicino a un bosco, e si occupò lui stesso delle protezioni mimetiche. In quel periodo le foglie non erano nulla di più che germogli, e il sole faceva puzzare la vernice. Era proprio come recitare a teatro! Ma eravamo contenti. Proprio contenti! Credo che se fossimo stati dei cingolati, come i nuovi grossi obici da sei pollici, si sarebbero ricordati di noi. Ma eravamo i vecchi La Bassée Mark del '15, artiglieria che viaggia su rotaia, buona solo come ferrovecchio in quel periodo finale della guerra. E, credetemi, signori... o fratelli... devo dire che le abbiamo prese di brutto. Eccome! Era di pomeriggio, e stavo guardando Gander che istruiva una classe sul nuovo mirino di Lady Catherine. All'improvviso ho sentito strapparsi le protezioni, e ho visto venir giù un portaordini in motocicletta, venir giù dall'aria, come quel tipo che era solito saltare in bicicletta dal molo di Brighton, e atterrare con un tonfo tremendo quasi sopra alla classe. «Vecchio mio», dice Gander. «Non è il modo di fare rapporto. Che succede?» «Primo, le vostre protezioni mi hanno rotto la schiena» dice il tipo a terra; «e, secondo, l'intero fronte è andato.» «Sciocchezze» dice Gander. Aveva appena fatto questo commento che l'uomo ebbe un conato violento e tirò le cuoia. Era pieno di carte di generali di brigata e ufficiali di comando che dicevano di essere stati tagliati fuori e chiedevano ordini. Aveva ragione su entrambe le cose... la sua schiena e il nostro fronte. Tutto il fronte della Somme fu spazzato via in un battito di ciglia!" Si sbatté la grossa mano aperta sulle ginocchia. "In quel periodo ne sentimmo parlare in Terrasanta. Fu davvero tutto così rapido come è stato detto?" disse Anthony. "Ancora di più! Stammi a sentire! La motocicletta ci cadde addosso all'incirca alle quattro del pomeriggio. Dopo, cercammo di avere ordini di qualsiasi genere, ma non arrivò nulla salvo che tutti i trasporti disponibili erano in uso e che non era probabile che si liberassero. Questo non ci era di nessun aiuto. All'incirca alle nove si presentò un giovane ufficiale di collegamento in guanti marroni. Fu molto sorpreso di trovarci lì. Disse che stavano evacuando l'area e avremmo fatto meglio a muoverci. «Per andare dove?» dice 'Ammick, in modo piuttosto brusco. "«Cani ammutinati» dice 'Ammick. «Ma siamo nell'epoca della democrazia. Ritenete che faranno obiezioni a scavare gentilmente un pochino?» «Assolutamente no» dice Gander. «Sono tre ore che il sergente maggiore glielo fa fare, come se fossero cani da cerca.» «Visto che le cose stanno così», dice 'Ammick, «Macklin può portarci un bicchierino di porto.» Poi arriva Mosse - riusciva a sentire l'odore del porto a un miglio di distanza - e afferma che avremmo solo aumentato la congestione a Amiens se avessimo portato i nostri lì, mentre, se ce ne fossimo rimasti in disparte lì dov'eravamo, Jerry magari non avrebbe fatto caso a noi, anche se non sembrava che stessero tralasciando molto quella sera. "Tutta la campagna era piuttosto rumorosa, e noi stessi avevamo dato fuoco ai depositi di munizioni tanto da segnalarli in alto nel cielo fino a dove arrivava la vista. Starcene lì era la cosa migliore. Credo che avremmo potuto scamparcela, se fossimo stati lasciati soli, ma verso mezzanotte - c'era un po' di robetta che ci sibilava intorno, ma niente di particolare - un vecchietto pelato e beneducato in uniforme si infilò nella trincea pulendosi gli occhiali e dicendo che stava pensando di formare, col suo battaglione appena arrivato, un fianco difensivo alla nostra sinistra. 'Ammick dice che se fosse stato in lui non avrebbe formato un bel niente. «Oh, non dite così» dice il vecchietto, molto scosso. «Qualcuno dovrà pure aiutare i cannoni, no?» 'Ammick dice che stavamo facendo riparazioni e che, quanto a efficacia, in quel momento ne avevamo quanto una latrina pubblica. «Andate a Amiens» dice, «e difendete quelli che stanno là.» «Oh, no», dice il vecchietto, «io e i miei ragazzi dobbiamo creare un fianco difensivo per voi», e salta fuori dalla trincea come un cardellino ammaestrato, cinguettando ai suoi 'ragazzi'. Dio sa che razza di tipi erano - la maggior parte ragazzini - ma gli si attaccavano alle falde del cappotto come a una festa scolastica domenicale, e per un po' li sentimmo trafficare allo scoperto. Poi ci furono dieci minuti di un fitto fuoco di sbarramento, e 'Ammick pensava che i ragazzi fossero già fuori gioco. «Fra poco toccherà a noi», dice Mosse. «C'è stato un gruppo di Gotha (25) che si è dato da fare nell'ultima mezzora, penso per scovare la ferrovia. È probabile che ora se la prendano con noi.» «A proposito» dice 'Ammick, «uno di loro sembra che ora voli piuttosto basso. Mi sa che è per noi, miei dotti colleghi!» «Gesù"» dice Gander, «credo che abbiate ragione, signore», e queste furono le ultime parole che sentii sull'argomento." "Allora vi beccarono?" disse Anthony. "Sì. Penso che Mosse avesse ragione, e che ci avevano presi per la ferrovia. Quando rinvenni, ero steso fuori dalla trincea, che era stata praticamente riempita. Il reverendo Collins era in buona salute, ma per Lady Catherine e il generale non rimaneva che pregare. Sono rimasto steso lì, cercando di capire, finché non sentii freddo e mi guardai. Per forza, non avevo nulla addosso salvo gli stivali. Così mi alzai e mi misi a camminare per scaldarmi. Poi, al chiaro di luna, vidi qualcosa come un fungo. Era la testa pelata del vecchietto beneducato. La toccai leggermente. Lui e i suoi ragazzi le avevano proprio prese. Presumo un battaglione arrivato in fretta e furia dall'Inghilterra. Non avevano nemmeno cominciato a scavare, povere piccole pesti! Mi vestii con le loro divise, e mi coprii con un bel cappotto britannico. Poi tornai alla trincea, e qualcuno mi disse: «Scava, bestione, scava! Gander è lì sotto.» Così aiutai a smuovere della roba finché vomitai sangue e bile mischiati. Poi caddi giù, e loro tirarono fuori Gander, morto, e lo lasciarono vicino a me. Anche 'Ammick era andato, tagliato a metà, disse il sergente maggiore; ma la cosa buffa è che aveva chiacchierato un sacco prima di morire, così mi dissero, con niente al di sotto dello stomaco. Mosse non fu mai trovato. Stava in piedi vicino a Lady Catherine. A quanto pareva, il cannone si era sollevato e rovesciato su di loro, insieme a mezza trincea." "E che ne è stato di Macklin?" disse Anthony. "Non lo so... Era con 'Ammick. Credo che sia saltato alla prima bomba, perché io ero l'unico Janeite rimasto. Perdemmo quasi metà della compagnia, sia sotto che dopo che li avevamo tirati fuori. Al mattino il sergente maggiore andò fuori di testa, andava su e giù dall'uno all'altro dicendo. «Era un buon gruppo! Era una grande compagnia! Avete mai visto qualcuno che potesse competere con loro?» E poi si metteva a piangere. Così quelli che erano rimasti se ne andarono per conto proprio, e io m'imbattei in un camion pieno zeppo, ma mi fecero salire." "Ah!" disse Anthony con orgoglio. "«Tutti prendono un taxi quando piove». (26) Hai mai sentito questa canzone?" "Tornarono indietro per un lungo tratto. Poi io camminai un po' e trovai un treno-ospedale che si andava riempiendo, e una delle sorelle - una coi capelli grigi - corse verso di me agitando le mani rosse e dicendomi che lì non c'era spazio nemmeno per un pidocchio. Ormai non me la prendevo più. Ma proseguì chiacchierando a più non posso della guerra, del padre a Ladbroke Grove, di come era strano per lei, alla sua età, fare quel lavoro in mezzo a un sacco di uomini, del dopoguerra, di come le infermiere dovessero mettersi pantaloni color cachi per via del fango, come le campagnole; e questo le fece venire in mente che se fosse riuscita a mettere le mani su un uovo me l'avrebbe fatto sodo, perché a suo tempo aveva gestito un allevamento di polli. Non si era mai sentito niente di simile, all'infuori di Jane. Mi fece ricominciare a ridere. Poi arrivò una donna che sembrava più in alto di lei. «Che succede?» dice. «Che volete?» «Niente», dico io, «solo far smettere di chiacchierare Miss Bates, questa qui, sennò muoio.» «Miss Bates?» dice. «In nome del cielo, che cosa vi spinge a chiamarla così?» «Perché lo è» dico io, «Ma sapete che cosa state dicendo?» dice lei, e mi abbranca con le braccia ossute per tirami su. «Certo che lo so», dico, «e se conoscete Jane lo sapete anche voi.» «Basta così» dice lei. «Salirete su questo treno, dovessi anche uccidere un generale per voi», e lei e una bella infermiera mi issarono sul treno, su una barella vicino alle cucine. Quel brodo di carne andava giù a meraviglia! Mi strinse la mano e disse che avevo subito fatto colpo su sorella Molyneux, e poi sgraffignò una coperta in più per me. Era proprio il suo ospedale. Mi aspettavo che fosse la Lady Catherine de Bourgh del luogo. Be', e così, per farla corta, non venne fuori altro." "Non ne avevi avuto abbastanza?" chiese Anthony. "Credo di sì. D'altronde, se la vecchia compagnia avesse continuato a esistere, avrei potuto avere solo un altro turno con loro prima dell'armistizio. Il nostro sergente maggiore aveva ragione. Non c'era mai stato un gruppo così indovinato. 'Ammick, Mosse, Gander, il sergente maggiore e quel povero piccolo Macklin che mi istruiva, mi faceva andare oltre, mi elevava e mi metteva su un treno-ospedale dopo che era morto, tutto per un paio di Bradbury. (27) Sto ancora sveglio di notte, a ripensarci su. Non c'è mai stato un gruppo pari al nostro... mai!" Anthony mi restituì il gioiello del segretario splendente. "Ah", disse. "Non si può negare che l'affare di Jane per te è stato più utile delle Aquile Romane o della Stella della Giarrettiera. (28) Peccato che non ci fosse nessuno dei tuoi Janeites in Terrasanta. Non ne ho mai incontrati." "Be', come diceva il povero Macklin, è una società molto esclusiva, e dovevi essere un Janeite dentro di te, oppure non avevi nessuna possibilità. Eppure fece di me un Janeite! Ora leggo tutti e sei i suoi libri con piacere mentre sto in negozio, e questo mi riporta indietro... fino all'odore della vernice delle protezioni. Credetemi, fratelli, non c'e nessuno pari a Jane quando ti trovi in una brutta situazione. Dio la benedica, chiunque sia stata." Il venerabile fratello Burges ci chiamò tutti, dal pianterreno della Loggia, per passare dal lavoro al ristoro. Humberstall si sollevò - in modo così simile a un cavallo da tiro che quasi ci si aspettava di sentire lo schiocco dei finimenti sulla schiena - e scese gli scalini. Disse che non poteva restare per il tè perché aveva promesso alla madre di tornare per prenderlo a casa, e molto probabilmente lo stava aspettando all'ingresso della Loggia. "Viene sempre qualcuno a prenderlo. Talvolta gli capita di perdere le staffe", mi spiegò Anthony mentre lo seguivamo. "Intendi dire che tende ad alzare il gomito?" "Lui! non ha mai toccato un liquore più di quanto abbia toccato una donna, da quando è nato. No, è soggetto a qualche genere di attacco di tipo tranquillo. Gli sono venuti dopo lo scoppio a Eatables. Ma grazie a quello era diventato sergente maggiore di batteria." "Oh! ", dissi. "Non riuscivo a capire perché era stato messo a fare il cameriere a mensa una volta tornato ai suoi cannoni. Questo spiega un po' le cose." "La sorella mi ha detto che lo scoppio aveva cancellato tutte le istruzioni sui cannoni che aveva in testa. La sola cosa rimasta era di voler tornare alla sua vecchia compagnia. Dio sa come ha fatto, ma ci riuscì. Praticamente dice che scappò dall'Inghilterra per andare da loro, e quando videro lo stato in cui era, non ebbero il coraggio di spedirlo indietro o a un ospedale. Lo tennero come mascotte, per così dire. Questa è tutta la pura verità. Me l'ha detto la sorella. Ma non posso garantire per la faccenda del Janeite, salvo che non ha mai detto una bugia da quando aveva sei anni. Me l'ha detto la sorella. Che ne pensi?" "È improbabile che l'abbia tirata fuori di testa sua", risposi. "Ma la gente non diventa all'improvviso così pazza per i libri, no? Ha fatto sì che anche la sorella provasse a leggerli. Lei farebbe di tutto per compiacerlo. Ma, come continuo a dirle, dovrebbe farlo anche la madre. Tu ne sai qualcosa di Jane?" "Credo che Jane fosse un po' una che combinava matrimoni, in modo tranquillo, quando era viva, e so che tutti i suoi libri sono pieni di persone che combinano matrimoni", dissi. "Tu faresti meglio a stare attento." "Oh, questo è poco ma sicuro", rispose Anthony, arrossendo. "I did - and do!" (1) Nel racconto In the Interests of the Brethren (Per il bene dei Confratelli). Nelle logge massoniche la sigla "E.C." sta per "of English Constitution". (2) "Past Master", ovvero un ex Maestro. Il Maestro della Loggia era in genere eletto per un periodo di un anno. (3) Gli "Emblems of Mortality" erano ossa umane. (4) Qui fratello Burges considera fratello Anthony come un resuscitato, visto che era saltato in aria due volte, probabilmente per lo scoppio del cannone che stava manovrando. (5) Etaples, in Francia, scritto come lo pronunciavano gli inglesi. (6) I Gotha erano bombardieri tedeschi costruiti dal 1916 in poi; "Victoria" è la stazione Vittoria. (8) L'originale "wop" è "wallop" in dialetto scozzese. (9) Nell'originale: "and, mind you, they weren’t radishes - they seldom or ever repeated" c'è un gioco di parole su "repeated", un verbo che significa "ripetere" ma anche "tornare su" quando si parla di cibo, in questo caso i ravanelli, citati in quanto poco digeribili. (11) "Bubbly" (pieno di bollicine) era in effetti una rivista teatrale scritta da John Hastings Turner, con musica di Philip Braham, messa in scena la prima volta nel 1917 al Comedy Theatre di Londra, ma era anche il modo in cui veniva chiamato lo champagne. (12) Lo scrittore Henry James (1843-1916), che era stato amico di Kipling. Qui viene evidentemente suggerita una discendenza letteraria tra Jane Austen e Henry James. (13) Uno dei nomignoli con i quali venivano chiamati i soldati tedeschi. (14) Così veniva chiamata la prima banconota da una sterlina, firmata dal ministro del tesoro John Bradbury. (15) Tilniz sta per Tilneys (i Tilney), e la parola d'ordine si riferisce a una frase dal cap. 11 de L'abbazia di Northanger: "Percorsero velocemente Pulteney Street, e attraversarono Laura Place, senza scambiare molte parole. Thorpe parlava al cavallo, e lei meditava, a turno, su promesse infrante e archi infranti, su phaeton e falsi panneggi, sui Tilney e i trabocchetti." (16) Dobbin è un nome convenzionale per cavalli da tiro; come soprannome significa qualcosa come "stupida bestia da soma". (17) Il riferimento è al cap. 25 di Emma, quando Frank Churchill va a farsi tagliare i capelli a Londra, anche se poi si scoprirà che aveva fatto anche altro. (18) Forder era il nome della principale ditta che costruiva vetture da noleggio, ed era diventato sinonimo di queste ultime. I primi taxi venivano chiamati allo stesso modo. (19) Frase araba che significa "Vattene, cane". (20) Laura Place, in Persuasione, è l'indirizzo in cui vanno ad abitare la viscontessa Dalrymple e la figlia, Miss Carteret; ne L'abbazia di Northanger è citata di sfuggita nel cap. 11. Era anche vicina alla prima casa degli Austen a Bath, a Sydney Place. (21) Anne Elliot e il capitano Wentworth. Il riferimento al luogo in cui il loro fidanzamento viene rinnovato non è esatto, visto che nel romanzo la scena si svolge a Union Street e non a Laura Place, ma Macklin potrebbe anche aver inteso richiamare Bath in generale. (22) Nell'originale, Macklin dice: "We will consider it in Common Room"; "Common Room" era chiamata a Oxford la sala di ritrovo dei membri del college, ed è come se Macklin volesse rimarcare la sua cultura, cosa sulla quale il sergente aveva ironizzato chiamandolo "professore". (23) Humberstall aveva scritto"de Bugg" anziché "de Bourgh". Dato che "bugg" (ovvero "bug") significa anche "insetto, verme" il sergente potrebbe averlo interpretato come un insulto. (24) Vedi la nota 13. (25) Vedi la nota 6. (26) Il verso è tratto da una canzone del musical The Girl in the Taxi (1912), di Frederick Fenn e Arthur Wimperis, adattamento da un'operetta tedesca, Die keusche Susanne (1910), di Georg Okonkowski; la musica di entrambe le opere è di Jean Gilbert. (27) Vedi la nota 14. (28) Qui c'è un'allusione diretta a una delle cerimonie principali del rituale massonico, quella in cui all'apprendista viene dato il grembiule pronunciando queste parole: "È più antico del Vello Dorato o dell'Aquila Romana, più onorevole della Giarrettiera o di ogni altro Ordine esistente, essendo il segno della purezza e del vincolo dell'amicizia." (29) Versi che seguono il racconto, conclusi dai quattro già in epigrafe. (31) Nella prima edizione questi due versi erano: "Good Sir Walter met her first / And led her up the stair." (Il buon Sir Walter fu il primo a incontrarla / E la condusse su per la scala.). 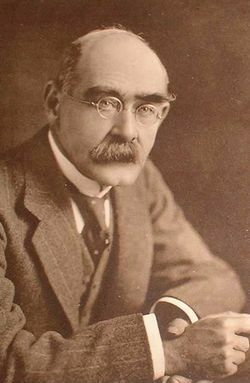 Quando fecero notare a Kipling che Walter Scott era morto quindici anni dopo Jane Austen, Kipling disse scherzosamente che in quel frattempo lei forse era stata in purgatorio, ma nelle edizioni successive cambiò i versi in: "Good Sir Walter followed her, / And armed her up the stair." (34) Miguel de Cervantes Saavedra (1547-1616).